Editing: Topaz infocus for sharpening, topaz adjust 5 - warm adjustment & cross processing preset, topaz denoise. This would be perfect as an illustration in a children's book - it's almost 3D and very nearly jumps off the screen at you. I do like the processing here. Beautiful, Kelli, and the processing is just perfect. a magical shot that is beautifully rendered. I love this one. The colortone makes me think of a story. I could see this with one of those inspirational quotes attached to it. You're braver than I am - i couldn't stand to have this thing on me let alone pose for a picture with it. Voted earlier coming back to comment now. I love butterflies so when one captures an interesting concept it captures my attention. Composition of subject and 'diagonal' lines are strong in this photo. The fingers emerge from the bottom left corner and the wings point towards the top right corner. 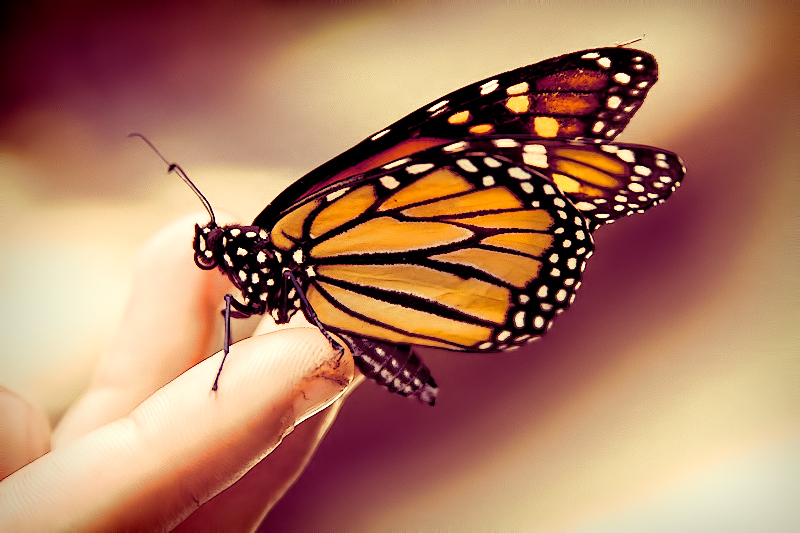 Wonderful detail is captured with this Monarch Butterfly. To me the picture symbolizes Man getting 'in touch' with Nature. Wonderful execution. Appeals to me. Proudly hosted by Sargasso Networks. Current Server Time: 04/20/2019 12:58:47 PM EDT.